Swing'em Again Golf - Sell us your used golf clubs. 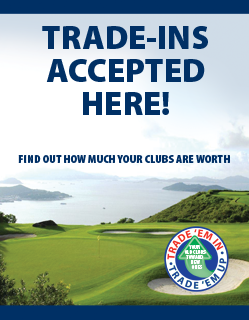 Today more than ever, customers expect to be able to trade in their old clubs for new ones. If you are not part of this way of doing business you may miss potential shop sales. All golf shops need a reliable partner to facilitate and manage this trend in the golf industry. Our goal is to make this process seamless for our partner golf shops. The most extensive value guide in the golf industry. Golf Shops are pre-paid for all of their Trade-ins. Shipping is FREE! All trade-ins from our partners are shipped to us free of charge. Our lower overhead allows us to pay you more than our competitors. We simply pay you more for Trade-ins. Personalized service ALL the time. Your questions and quotes are answered quickly by a dedicated team who really know their gear. Seasonal Trade-in Bonuses are offered to our Trade-in Partners. Start by creating an online account. Visit swingemagaingolf.com to register and create an account. Use our Club Quote Engine to price your golf clubs by selecting manufacturer, type, model, shaft and SEARCH on the home page. Select the number of boxes that you will be sending and verify your shipping info. Simply print pre-paid S/H Labels to ship us your clubs. Once your labels are printed and a UPS driver scans them, your payment is processed and sent to you in the mail. Switch to our service and enjoy the benefits of working with our Trade-in Specialists! Our instant quotes are made even easier for high volume Trade-in Facilities that partner with us. We will customize a page for you to process your trade-ins directly from your own website. CLICK HEREto view our Affiliate Program. CLICK HEREto view our FREE Marketing Material Page.